A Dutch Baby is a light, fluffy, not-too-sweet alternative to pancakes. This simple recipe is sure to please all of the breakfast-lovers in your house. My breakfast-loving sweetheart grew up in Chicago and his favorite breakfast place was the Original Pancake House. One of their signature dishes is a Dutch Baby (sometimes called a German Pancake) and the first time he took me to visit his home town we headed there so I could try one. It was unlike anything I had ever had, it was huge and puffy, the edges were crispy and the center was soft. It is very similar to a popover and is prepared simply with no syrup or heavy sauces, just powdered sugar and fresh lemon wedges squeezed over top right before you eat it. When we got home from Chicago I tried to work out how to make it, and it couldn’t be easier. You only need four ingredients; eggs, milk, flour and butter. You mix the eggs, milk and flour together to make a batter and you put the butter in a cast iron pan and let it melt in a hot oven. Once the butter is melted and the pan is nice and hot, you pour the batter in and let it bake for 20 minutes.The batter puffs up and gets golden brown around the edges, it’s a pretty impressive-looking breakfast! My favorite part is that I don’t have to stand over the stove flipping pancakes for everyone. I just pop it in the oven and make the rest of our breakfast while it bakes. 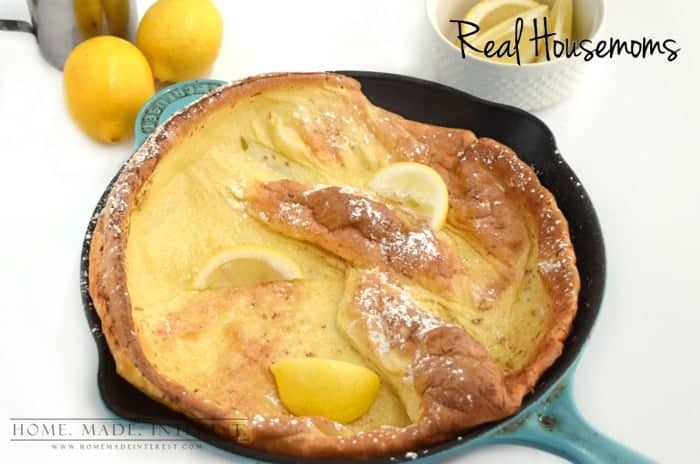 My guy doesn’t like a super-sweet breakfast so I just sprinkle the Dutch Baby with powdered sugar and slice up a few lemon wedges to squeeze over it, but you can also serve it with fresh fruit, a fruit compote, or even syrup. If you are making it for a big group, or don’t have a cast iron pan, you can use a casserole dish. Depending on the size of the dish you may need to double the recipe but other than that it cooks up just like it was in a cast iron pan. Next weekend try making a Dutch Baby, you won’t be disappointed! 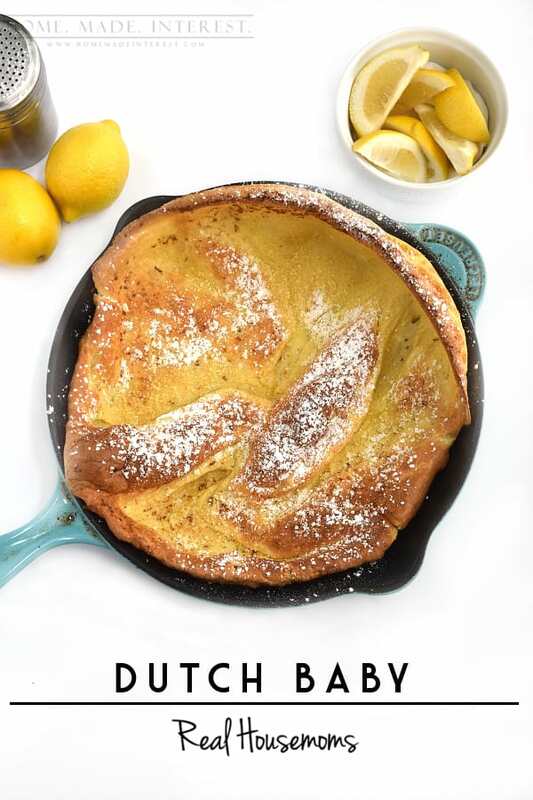 A Dutch baby is a light, fluffy breakfast food similar to a popover. Served simply with powdered sugar and lemon wedges, fruit compote, or syrup. Place butter in a cast iron pan. Put the pan in oven and preheat to 425 degrees. 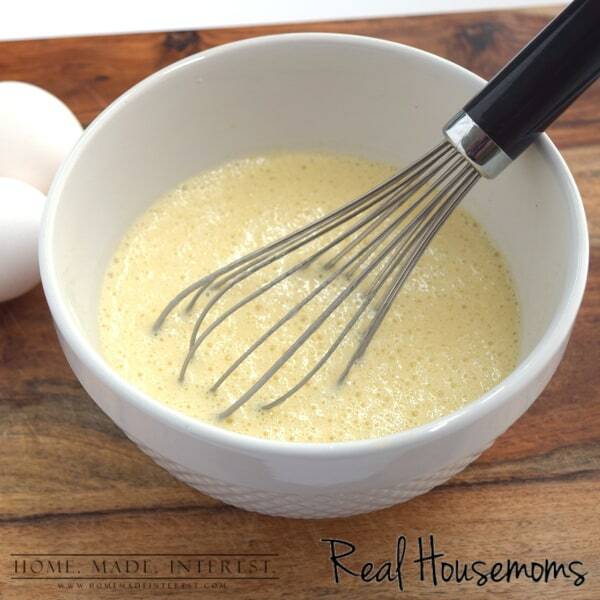 While the oven is preheating mix the other ingredients in a bowl using a whisk. When oven is preheated and the butter is melted pour in the batter. Oh man this sounds and looks so scrumptious!! I will definitely have to give it a try! Thanks ladies! This looks wonderful ! Would really appreciate knowing what size skillet you suggest ?? Sue, I used a 9″ skillet but I have used an 11″ skillet also and it didn’t make much of a difference. What if you don’t have a cast iron pan. Can you use a stainless or all clad? Yep, you can use anything that can go in the oven. I have even used a glass casserole dish! 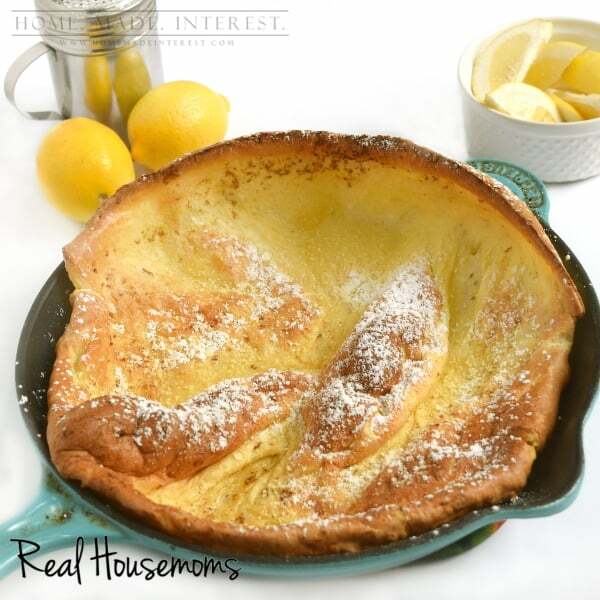 the Original Pancake House was our families favorite too, and my gram always got the dutch baby with berries – yours looks perfect! I have tried it with almond milk and it just doesn’t rise the same way. It still tastes good though! Can i make this with apple pie filling? Sure, you can put any kind of pie filling on top. I was thinking of adding vanilla & cinnamon to give it more of a French toast taste. Would that affect the rising? I haven’t done it before but I don’t think it would be a problem. What size cast iron pan did you use? I used a 10 inch cast iron pan for mine, but slightly smaller or larger will work just fine. You never say what size cast iron skillet! Hi Gail! if the butter is burning I’d preheat the pan, then add the butter, and once it’s melted and a little bubbly move forward with the recipe. Different ovens preheat at different rates and that can affect the butter. Hope this helps!